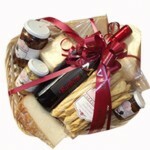 If you are busy or not sure what items “go together” then simply choose from ready-made baskets. They are generously filled with tasty pasta, fabulous sauces, mouth-watering biscuits or wine. Click here to choose a pre-made gift basket. Select your ready-made basket or hamper by clicking here. If you know the recipient`s taste then create your own basket simply by selecting a basket and items you wish to put in. We will wrap it nicely and you may even leave a message for the recipient that will be printed on a post card. Click here to choose a basket / hamper to create your own gift. Why is it great to make my own basket? If the recipient of the gift baskets is a vegetarian you can select non-meat products to suit his/her taste. Does he/she like savory or sweet? Choose from our range of popular Italian sweets like Cantucci almond biscuits or savory bread sticks, olive paste, grilled vegetables, etc. Create your own gift basket or hamper by clicking here. Your order may only be delivered during weekdays (Monday – Friday). Our current delivery fee is £7.00* (except for some rural areas of the UK, please see our terms and conditions) and the minimum order is £25.00. If you wish us to send your gift basket outside of the UK, please let us know and we will give you a quote on delivery fee (please note, that we cannot send alcoholic products outside of the UK). If you do not want to send it you may choose an option during the checkout to pick it up from our store. If you are ordering products that must be kept refrigerated (cheeses & charcuterie), please let us know where we can leave the parcel (with your neighbor for example) if you are not at home during the delivery. THIS IS IMPORTANT, because our packaging guarantee to keep temperature low only for about 24 hours. WHEN WE DISPATCH YOUR BASKET? We try to do our best, to process all the orders within 1 – 2 working days. However, if you order perishable items (cheeses & charcuterie) on Thursdays after 3.00pm & Fridays, they will be dispatched the following working day which is Monday (except for Bank holidays) and delivered the next day Tuesday. BUT if you have a preferred day when you wish the order to be delivered, please let us know when placing your order.